The SLC-Series eccentric disc pump from Mouvex. Mouvex says that the eccentric disc pumps can deliver increased profitability and lower ongoing maintenance costs in the transfer of various chemicals due to its good volumetric efficiencies. Mouvex adds that the volumetric performance of the new SLC-Series pumps - unlike gear and lobe pumps that lose efficiency as they wear - sustains high efficiency levels over time, resulting in productivity gains and energy savings. 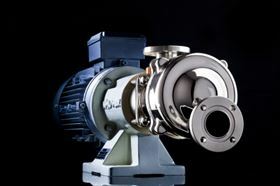 According to Mouvex, the eccentric disc pumps can be used in multiple fluid-handling applications within the chemical processing and distribution industries. The eccentric disc pumps are said to be capable of delivering high-volume efficiency while maintaining its gentle fluid-handling nature. Mouvex adds that the SLC-Series pumps are designed to self-compensate for mechanical wear and maintain consistent flow over time. Other SLC-Series eccentric disc pump design benefits include seal-less construction and low shear and agitation of the pumped product. The pumps also have the capability of handling solids and abrasives, and offer self-priming and line stripping. They have the ability to run dry for up to five minutes and offer a clean-in-place capability. According to Mouvex, the eccentric disc technology produces the pumping performance of a positive displacement pump, creating a constant flow that is independent of both pressure and viscosity. The new SLC-Series pumps are suitable for handling thin, abrasive, aggressive and higher viscosity fluids. With their stainless-steel construction and high volumetric efficiency, they can be tailor-made for chemical transfer applications. The pump line is available in stainless steel and ductile iron models capable of handling up to 10,000 cst (46,000 SSU) liquids and working pressures up to 130 psi (9 bar), depending on the model.